Just in case you missed the buzz and the webinar we just had on getting started with GooglePlus we now have the recording available! I’d like to thank Rebekah Radice of Better Homes and Gardens Real Restate, and Bobby Carroll of Dakno Marketing for joining us! 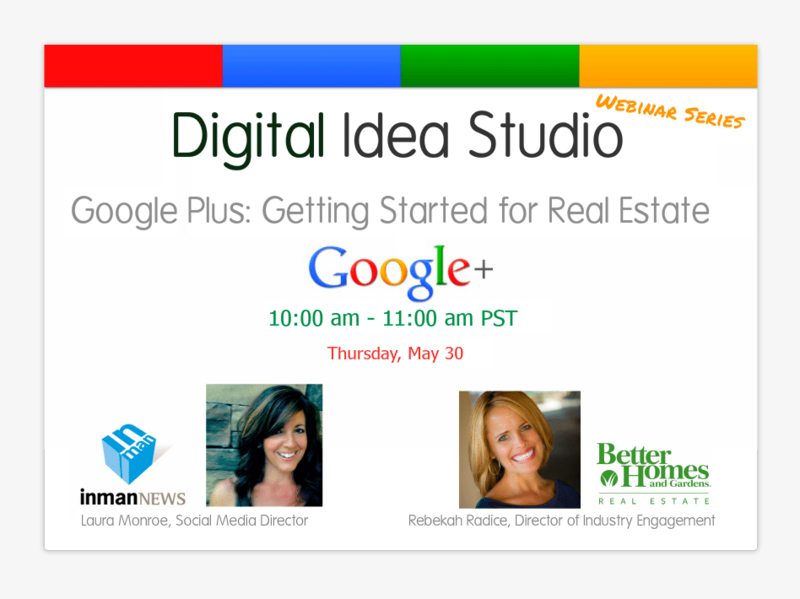 We’ll be scheduling “Google Plus for Real Estate Marketing” in the coming weeks, and we’ll be diving a little deeper! Google Plus has been quietly growing into a powerhouse in Social Media and Search. Find out why “Social Search” is an important component to your content marketing strategy. If you are new to Google Plus, this FREE webinar will give you the why and the how to’s for getting started! Presented by Laura Monroe, the Director of Social Media of Inman News, and co-presented by Rebekah Radice, Manager of Industry Engagement at Better Homes and Gardens Real Estate.